There comes a time in most of our knitting careers when we want to knit something for the children in our lives. For some of you that’s what got you started knitting in the first place. 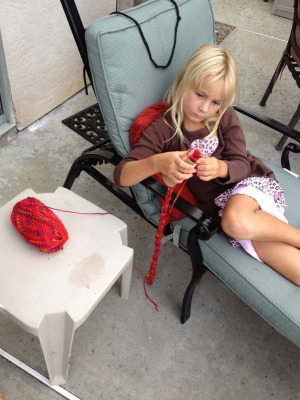 Knitting for kids is fun because you can use bright colors and the tiny patterns work up so quickly! But lets take a minute to consider a few things before jumping into knitting your next pint-size sweater. Cotton and washable wools are very common for knitting for kids and babies but you can find childrens patterns in anything from linen to cashmere. Think about how much time you want to spend taking care of the little sweater you will be knitting. Most luxury fibers need hand washed so in general I would say that for a child they are impractical. Not to say that you can’t knit a sweater out of cashmere but most moms I know probably don’t want to take the time to hand wash their child’s sweater. Cotton is a good option but it doesn’t feel as soft or warm as animal fibers and tends to grow as gravity takes its toll. So what yarn should you use? I recommend using a washable wool yarn like Wooly Worsted by Ewe Ewe so you still get that cozy feel to your sweater but you can have the easy way out when it comes to washing. Babies have sensitive skin so the softer the better when it comes to yarn! One extra bonus for using a wool yarn is that wools are naturally water resistant, I have actually seen potentially staining liquids just roll off the sweater - win! If you are knitting this sweater as a gift, a smart idea would be to include instructions for washing with the sweater. Sometimes it is fun to do the traditional pink and blue for boys and girls but consider mixing it up for a more modern, fun feel. Great colors to try for boys are black, greys, green, teal, aqua, orange, yellow, red or maybe even some variation on the traditional pastel blue. For girls try, yellow, green, fuschia, lavender, teal, purple, cream or bright pink. Conveniently, Ewe Ewe has a ton of great colors to choose from! If you’re making this sweater as a gift try asking the parents what color or colors their child really likes. If it is for your own child it is fun to involve them in the process by letting them choose their own colors. Kids can be picky about what they wear sometimes but having a sweater in their favorite color is almost always a hit! Babies and kids have large heads in comparison to their body size. As you’re planning which sweater to knit keep in mind that the easiest sweaters to get on and off will be cardigans or V-necks instead of crew necks. If you decide to use buttons make sure that they are sewn on tightly so that toddlers and babies can’t pop them off and have them end up in their mouths. If you’re worried about having buttons perhaps try a zipper instead. Zippers are a cute design feature and can also be a teaching tool for kids! If you would like to learn more about which yarns to choose for your next sweater project download our free Sweater Planning Guide. It will walk you through how much Wooly Worsted to buy, checking gauge and everything else that goes into preparing to knit a sweater. This guest post is part of the 30 Day Sweater Challenge promo tour. Join us this October as we help 5,000 knitters around the world knit a sweater they’ll love, in 30 days. 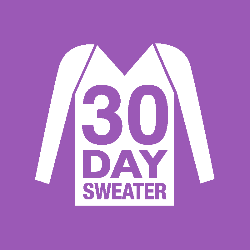 To sign up just visit http://30daysweater.com/eweewe and download your free sweater planning guide. It will help you get started on the right track! See you in October!